Cryotherapy has a futuristic ring to it and this new 21st century cooling technique is providing great results for sports injuries and is proving beneficial for a whole host of other health-related conditions. As the technology and methods have become more sophisticated, cryotherapy is now also used for a range of treatments, including: to increase immunity, enhance hormonal profile, inflammatory conditions, and sleep recovery to name a few. The therapy produces two key systemic responses in the body which prompt the brain to release large bursts of endorphins quickly, and additionally a cold shock protein called norepinephrine is also released at enhanced levels. The norepinephrine has a significant anti-inflammatory properties and endorphins are a natural mood-booster and also block pain response signals. This combined effect means that those undergoing the treatment begin to experience the beneficial effects almost immediately. Using extreme temperatures for their healing properties goes back thousands of years, and in recent times many surgical and emergency procedures now utilise cooling technologies. For therapeutic treatments the useful effects have been found to be astounding in a whole range of conditions from sports recovery to beauty and fitness enhancements, and even mental health conditions. Other beneficial effects include a flushing of toxic waste when the body starts to heat up again and a replenishment of blood that enables cellular regeneration to take place which is an added bonus of the therapy. Whilst the human body is renowned as being great at self-healing, sometimes chronic conditions and inflammation can cause these repair systems to break down, and this is where cryotherapy can reset the whole system. What Happens When You Go For Cryotherapy Treatment? So what happens if you decide to go for cryotherapy? Well, the whole process is over quite quickly as the treatment only lasts for three minutes. When you arrive for cryotherapy treatment you will be talked through the whole process by trained cryotherapy technicians who will show you the chamber, explain the process and leave you to change and then accompany you after you have finished your brief session. 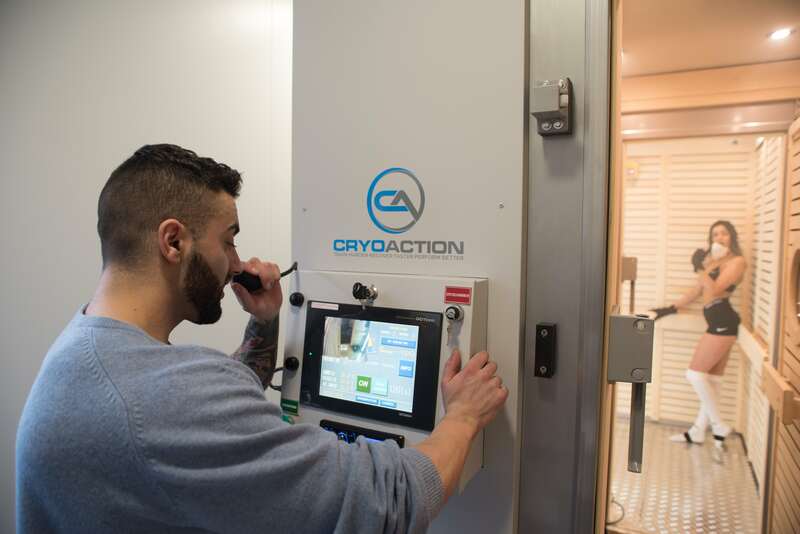 Here at CryoAction, we are a leader in cryotherapy for elite sports and provide our services for a range of elite hotels, spas and sports organisations. We can provide expert advice on a wide range of equipment and treatments.